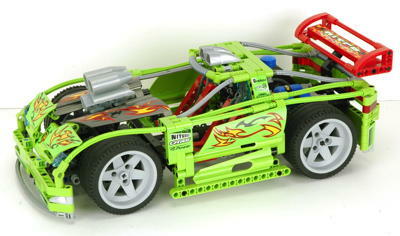 A total of 8 Technic sets were released in 2005, 2 of which were in the Racers line. The models had a vast size range from a couple of very small construction machines to the largest forklift, motorcycle, and mobile crane to date. 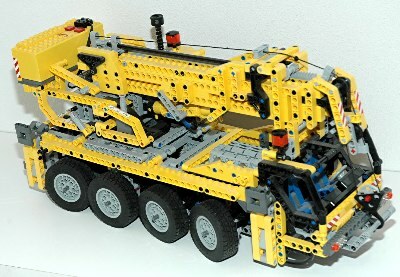 The 8421 Mobile Crane in particular was remarkable in several ways. 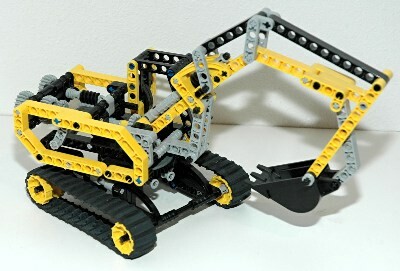 At the time, it was the largest Technic set ever made with almost 1900 parts. It also included 8 tires, a motor, and a 3 stage telescoping boom, all firsts. The 8420 Motorcycle also included many new parts including wheels, tires, an adjustable shock absorber, and a windshield. 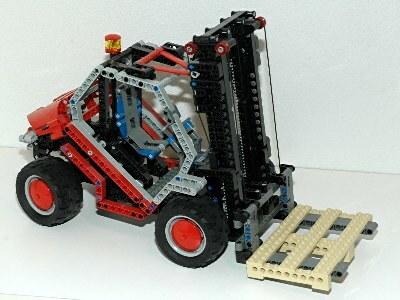 The 8416 forklift had the first (and only) 2 stage lift mechanism. This year began the recovery of Technic and of the whole LEGO® company with a more focused product strategy. Gone from Technic were the various play themed sets or character based sets. Gone was the "Tech Play" and "Tech Build distinction on the 1990's. Instead the Technic line focused on realistic and functional representations of real world vehicles at a wide range of sizes and price points. 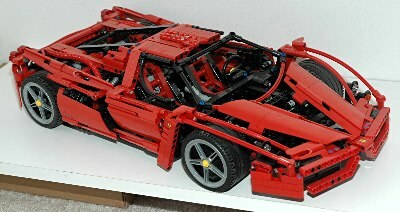 Although every product lineup of former years included a range of model sizes, this year could be considered the first year where there was a dedicated "flagship model": the year's largest model clearly designed to stand out at the highest price point with the highest number of parts which highlights the limit of what was possible with the Technic building system at the time. Each year the flagship model tended to introduce new parts and push the state-of-the-art to the next logical level. The new parts this year were remarkable in the sense of their scarcity. 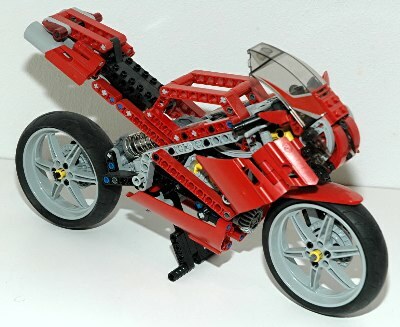 Most of the new parts never appeared again in a newer set, and even those that did appear again did so rarely. The 8421 crane came with a set of yellow brackets which are used to connect a pair of pneumatic actuators back-to-back in series (as shown) to increase the overall length and stroke. 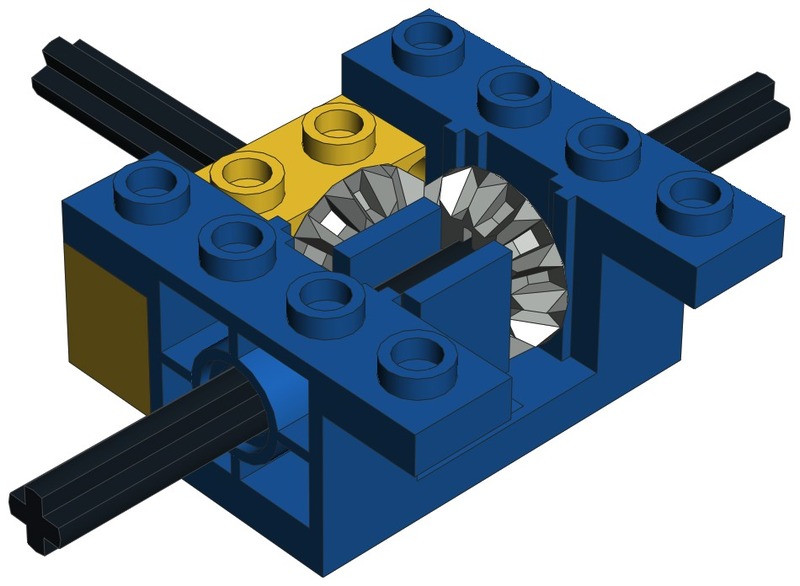 While successful at this goal, these parts only ever appeared in one other set, and that set did not even have pneumatics. Because of the popularity of pneumatics among fans and the need for longer length, these brackets are highly prized and very expensive to acquire. The 8420 motorcycle introduced a new adjustable shock absorber. This very large has a stiff spring and an adjustable collar. If rotated 90 degrees, the collar slides up a ramp and preloads the spring resulting in a harder suspension (although the rate stays the same). Both positions are pictured. The yellow version of this shock only ever appeared in the one set. Some versions of the set came with a dark gray version instead. 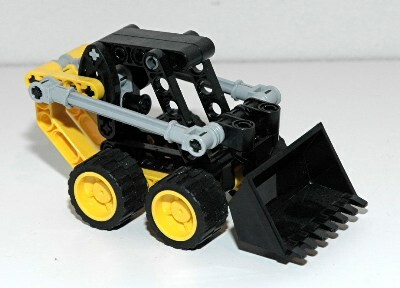 That version also never appeared in another Technic set but did appear in some Racers. The 8420 motorcycle introduced a new transparent black windshield, unique to that set. A new 32L axle was introduced, the longest ever produced. It was needed for the long telescoping boom of the 8421 crane. The notched 2L axle was also changed to red to meet the new color coding policy and make sorting easier. The older black pins are prized for their neutral color. The line of double bevel gears was expanded to include a large 36 tooth version, nearly always black. 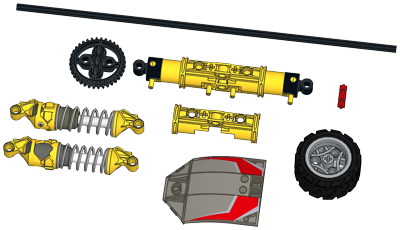 This gear appears in only a handful of Technic sets. 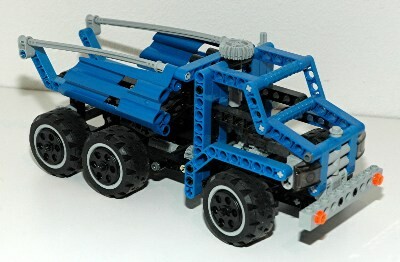 The small 43.2 x 22 tires included in the 8415 truck have a strange tread and never appeared in another Technic set. 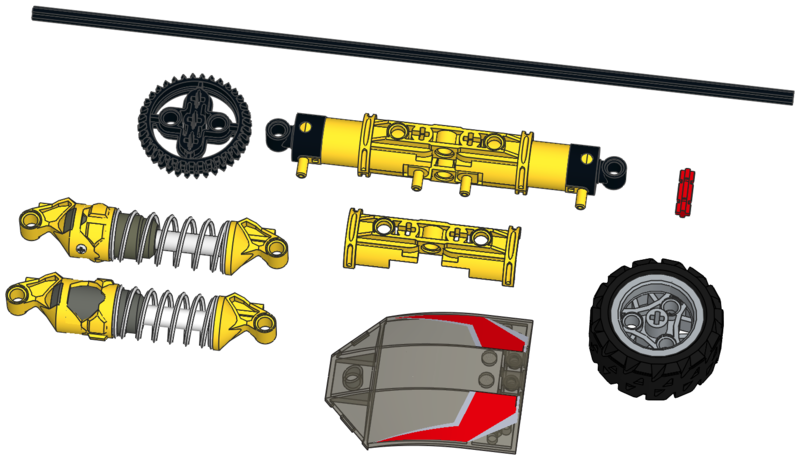 The large, spectacular front and rear wheels and tires of the 8420 motorcycle are unique to that set and never appeared again. Both front and rear use the same wheel but the rear tire is wider than the front. 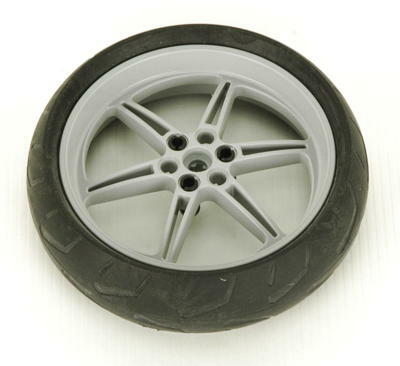 The tire is solid rubber (not pneumatic) and therefore quite difficult to install and remove from the wheel.